Castles are some of the most visited sites in the world. And no wonder, castles give us a glimpse of the past, and for a moment, the feeling of royalty. For this list of the best castles, we have compiled fortresses of sovereignty from across the globe. While the styles and sizes of these castles differ, one thing remains the same – all of these castles are truly wondrous. Read through our list of the best castles and before long you might just feel like royalty yourself! Planning a trip to see one of these great castles? Make sure you take advantage of our list of the best travel sites and best travel accessories. These lists will help you plan and make sure that you have everything needed for your trip. The largest castle complex in the world, Prague Castle is almost 70,000 square meters. Featuring Roman and Gothic architecture, this UNESCO World Heritage site is a gigantic feast for the senses. Other features include the crown jewels, the changing of the guards, and a beautiful garden. The iconic Neuschwanstein Castle is a fairy tale come true. It was actually used as a model for Disney’s Sleeping Beauty Castle. The castle is situated among the rolling hills and mountains of Germany which adds to the beauty of the castle. This idyllic setting perfectly complements Neuschwanstein Castle’s limestone facade. Edinburgh Castle resides on a cliff overlooking the historic city of Edinburgh and is home to Scotland’s crown jewels. Inside the castle grounds, there are a variety of rooms and exhibits to explore. And, with the castle located at one end of the Royal Mile, visitors can walk to other popular Edinburgh sites as well. Crac des Chevaliers is one of the best known and best-preserved Crusader castles in the world. Its hilltop location is formidable and offers sweeping views of the surrounding area. Finished in the 13th century, the castle was once described by Lawrence of Arabia as one of the most admirable castles in the world. This 13th-century castle is still around from medieval times and standing strong today. Conwy Castle has been a formidable defense over England’s history. English monarch Edward the First built Conwy between 1283 and 1289. He built the castle on a natural forming rock which greatly added to the castle’s defenses during its use throughout history. Blarney Castle is a medieval castle located next to Cork, Ireland. It is perhaps best known for its Blarney Stone, a stone that is reputed to bestow eloquence on all who kiss her. However, the Blarney Stone is not all the castle offers. The gardens and castle grounds are equally impressive and well worth exploring. Being attacked and besieged over the centuries, Warwick Castle has endured and is still alive and well today. Over the last ten years though, over 6,000,000 pounds went into the restoration of the castle. It is worth a visit not only for the beauty of the castle but also for the rich history behind it. A pivotal stronghold to the kingdom of Scotland over the centuries, it’s current day status is one of the top, must-see places in Scotland. With so many famous people in history using this castle at some point (Mary Queen of Scots, James VI, James I, etc.) it is worth visiting solely for the history. Stirling Castle is a must-see on this list of the best castles. Located in Portugal, Pena Palace comes with breathtaking views both inside and out. Technically labeled a “palace,” we thought it still deserved a spot on this list. It resides on the top of Serra de Sintra and can be seen from miles around. Almost destroyed in 1775 by an earthquake, Pena Palace was rebuilt by King consort Fernando II in the 19th century. This palace/castle is a must see if ever in Portugal. Dover Castle is known as the “Key to England” because it has been the nation of England’s first line of defense for so many years. This medieval castle is going to allow you to step back into time and see the inside of a medieval royal palace. There are also secret wartime tunnels that you can spend time exploring as well. Hohenzollern Castle has seen its changes over the centuries. It has been damaged, restored, and filled with different occupiers. Currently, though it sits as one the best castles in Germany and the world. Hohenzollern Castle sits on top of Mount Hohenzollern and can be seen from all around the surrounding area. The views inside the castle are equally impressive as you can see priceless pieces and beautiful rooms. Starting in 709 as a small church, Mont Saint Michel has morphed into a castle and the beautiful structure that it is today. The castle consists of a central abbey that was fitted with walls and other defenses in the 14th century during the 100 Years War. And, at one point it was also converted into a prison during the French Revolution. It was finally restored in the 19th century and stands as a UNESCO world heritage location today. Leeds castle has been coined “the loveliest castle in the world.” This is due to its beautiful interior, and it’s immaculately kept lawns and gardens. The castle’s last interior update was in the 1920s and ’30s. Along with the remodel, there are elegant tapestries, furniture, and porcelain pieces throughout. You can purchase tickets to tour Leeds Castle, and the tickets are good for up to one year. So if you are local, this a great way to get your money’s worth. In the 17th century, Heidelberg Castle/Palace was celebrated as the “8th wonder of the world.” And although time has taken its toll on the castle, it is still one of the most beautiful castles in the world. Elaborately sculpted figures line the outside of the palace, and the detail of the exterior is worth studying all by itself. The interior and gardens are the real draw for guests though. Glamis today looks more like a French Chateau than a medieval fortress. Don’t let its “modern look” though take away from the history that this old castle boasts. This Scotland castle has a fascinating history, making it worth the visit just from a historical perspective. It also has some more recent history as well though with it being Queen Elizabeth’s childhood home and Princess Margaret’s birthplace. With picturesque gardens and architecture, it would have been tough for us to leave the Château de Chambord of our list of the best castles. Visitors can appreciate the elegant design and beauty of this castle. Matching its breathtaking views though is a history that will not disappoint either. You will be able to appreciate the castle and grounds from a historical perspective as well. Known as the “Royal seat to the kings of Northumbria.” Bamburgh castle is full of history going back to England’s first days. The castle was a fortress in centuries past and is now a place that allows you to step back into time. 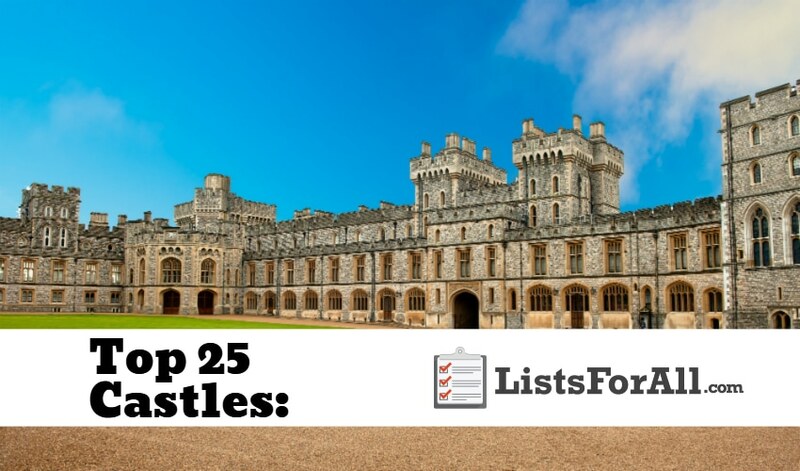 This isn’t the most luxurious castle on this list. However, it won’t take you long though to appreciate the structure and formidable presence that this castle represented so many years ago. With 653 opulent and exquisite rooms, the Schwerin Castle is pure luxury. Add in the idyllic island setting and elaborate gardens that surround the castle, and you will quickly forget that you are not royalty. If you are in Germany or planning a trip to Germany, Schwerin Castle needs to be on your travel itinerary. While both a medieval fortress and a royal residence, Bran Castle is perhaps best known as the setting for Bram Stoker’s Dracula, despite Stoker having never visited the castle. This misty mountain-top castle commands supreme views of the surrounding countryside, and the myth of Count Dracula lends an air of intrigue to the castle. Recently reopened after an extensive roofing renovation, the Himeji Castle is just a short drive from Kobe. Nicknamed the White Heron because of its white plaster walls, the 400-plus-year-old Himeji Castle is a must-see while in Japan. Home to the Queen of England, Windsor Castle is the largest and oldest occupied castle in the world. The castle complex also features the well-known St. George’s Chapel (the burial place of ten monarchs) and the Drawings Gallery which features changing exhibitions from the Royal Collection. Although more fortress than a castle, the San Felipe Castle is still an impressive building. Finished in the 18th century, the castle features a maze of tunnels – some tunnels are even lit for tourists to explore. Probably a wooden structure, to begin with, the current stone structure of the Kilkenny Castle was completed in the 13th century. Today, three of the castle’s original four towers survived and the castle is a popular tourist attraction in the summer time. Hearst Castle was built by media magnate William Hearst. The castle resides on the California coast and showcases sweeping views of the Pacific Ocean. Boasting a 127-acre hilltop complex of buildings, the main building, AKA Hearst Castle, is part museum, part opulent luxury. The setting for Shakespeare’s Hamlet, Kronborg Castle is located in the idyllic town of Helsingor, Denmark. Although the interior and grounds are open for exploration, perhaps the best part of Kronberg is the labyrinth of casemates the castle boasts. Castles are some of the most amazing human-made things on the planet. The fact that some of them are centuries old and are still around today make them even that much more impressive. We hope that this list of the best castles piqued your interest. Hopefully, it also inspired you to add a few more must-see places to your bucket list! Have you already been to one of these castles? Let us know your thoughts in the comments below. Edinburgh Castle is in Scotland not Ireland. Bram Stoker was the author of Dracula not as you say Bran like the Castles name. Bamburgh Castle is magnificent. Not sure they were meant to be luxurious!…. Heather, thanks for the fact check. We mislabeled Edinburgh Castle to Ireland in the title, but have fixed it and now have it correctly labeled for Scotland. And great catch on the Bram Stoker. We have corrected that as well. Thanks! Some very strange links to nations in this. Edinburgh Castle is most certainly in Scotland and has been linked to Ireland!!!!! Conway Castle? Susan, thank you for taking the time to comment. You are absolutely right about Edinburgh Castle being in Scotland. Please forgive us for the mistype in the title, we have corrected it now. Thanks!